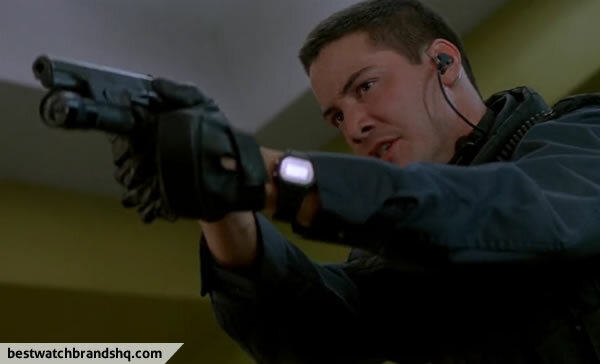 Keanu Reeves plays as SWAT officer Jack Traven in the Speed (1994) which is a fast paced action movie. Jack is up against a psychotic bomber who earlier tried to hold a rigged elevator of people for ransom only to fail. The bomber comes back with a vengeance where he exploded a city bus and later rigged another one where the bomb is activated if it goes over 50 miles per hour and will blow up if it drops below 50. 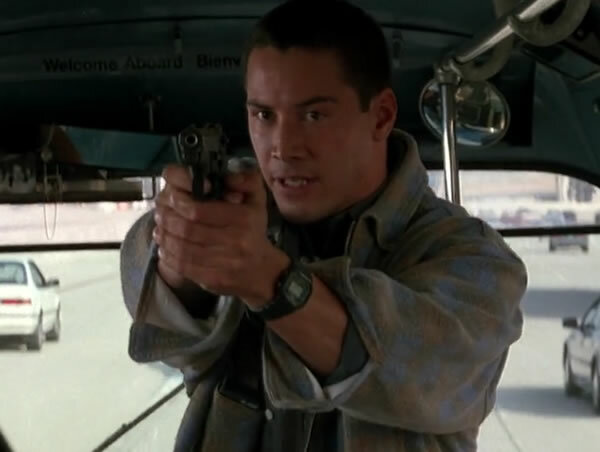 Jack tries to save the bus load of people as well as diffusing the bomb. 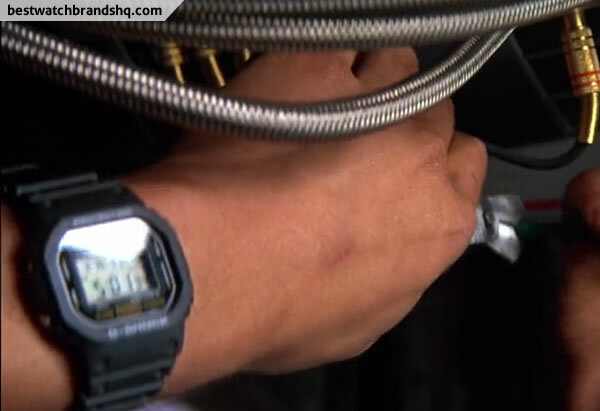 In the midst of all the explosion and gun fire during the movie, you get to see a clear shot of Keanu’s watch which is a 1987 Casio G-Shock DW-5600C-1V. 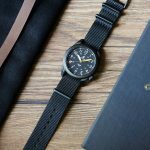 This is a classic model which was in production till 1996 and one of the few watch models to be qualified by NASA for space missions. 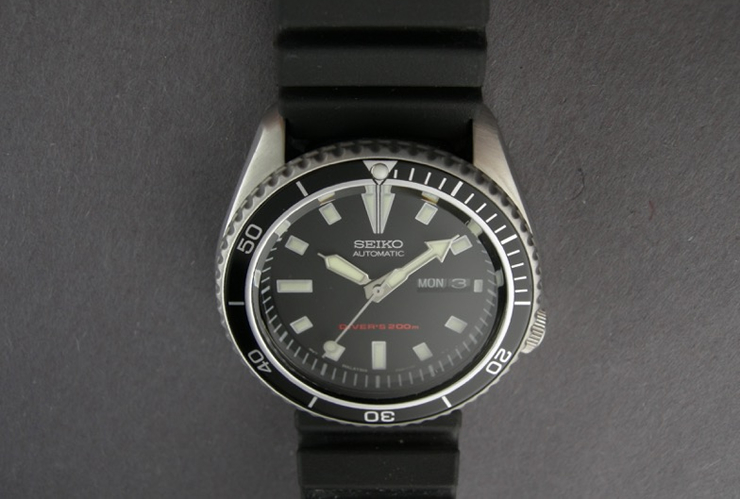 The DW-5600C-1V is cased in a stainless steel screwback which is different from the newer models. This model has 12-hour and 24-hour time format and when in default home mode you can see the time with seconds as well as the date, month and day of the week. Date is auto-calendar where you don’t have to set the date till 2029. It has one alarm as well as hourly signal. You can also set a second time zone and also has a countdown timer. The stopwatch is up to 1/100th second and has a tiny incandescent bulb backlight to let you see in the dark. It has a weird feature called a reminder where you will see a REM word flashing in all modes to remind you what you are supposed to be reminded off. Imagine if you have 10 things to remember. 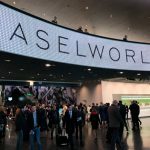 The DW which also stands for Digital Water resist to further highlight the water resistance of this watch which is up to a impressive 200 meters. It’s also housed in shock resistant case which is suppose to withstand a 10-meter fall. It also comes with a battery that can last up to 10 years or more. This rugged and resilient watch is made to withstand a lot of abuse and is one of the collectors’ item among G-Shock fans. 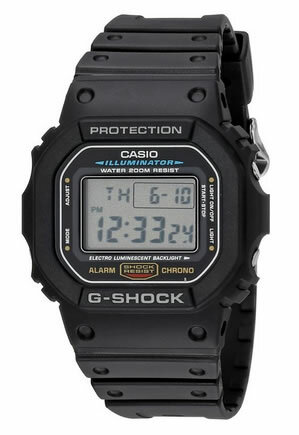 While you can’t get this model anymore, Casio has a direct successor which is the G-Shock DW5600E-1V which looks pretty similar. The difference is the ILLUMINATOR word replacing the WATER 200M RESIST. Also backlight is using electroluminescent or EL which will light up the whole screen but at the expense of shorter battery life of up to 2 years. Auto-calendar is up to year 2039 and this doesn’t have the dual time feature. 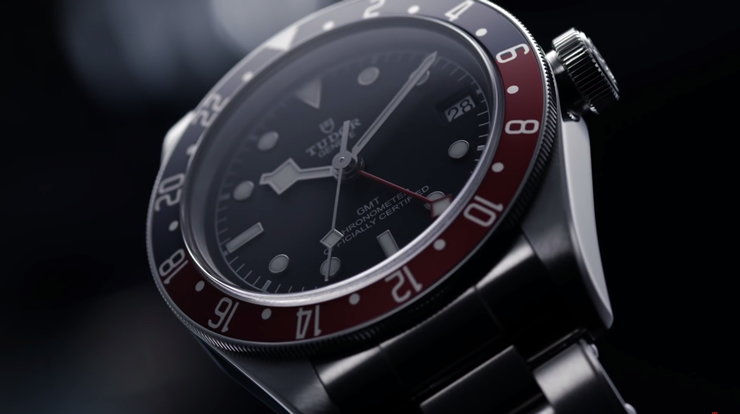 This newer model is using a composite-case and steel panel back which makes the watch 30% lighter. 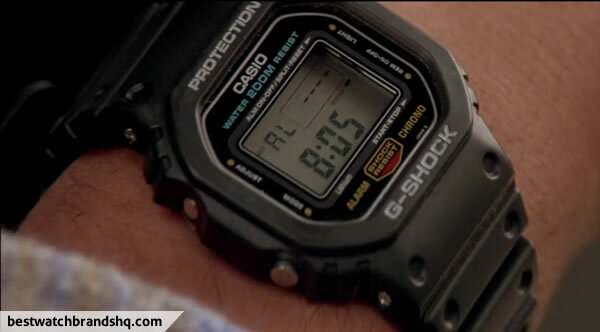 The rest of the features are similar to the DW-5600C-1V. You can get this model for around $42 at Amazon. 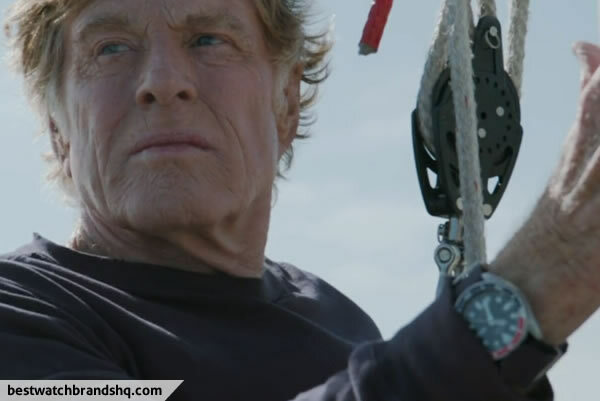 Check out wrist shots in the movie.